There are many reasons why the skin on your thighs appear saggy or lose their smooth appearance; age, gravity, and weight loss being the main culprits. Whatever the cause may be, thigh lift surgery (“ thighplasty”) may help recontour the thighs and create a smoother look. Ideal thigh lift candidates are those who have loose, sagging skin, with or without excessive fatty deposits. A thigh lift can tighten loose skin and may even improve cellulite in some people. Good candidates are those who have reached a stable weight, do not smoke, and do not have medical conditions that would prohibit safe surgery and wound healing. Targeting the inner thigh, the incision is made at the junction of the thigh and pubic area, where a wedge of skin and, if necessary, fat is removed. The inner thigh lift technique helps to provide an overall improved leg contour and enhance skin elasticity. This technique is designed to tighten the skin on the front and outside of the leg. The incision is placed where the top of the leg and the lower edge of a bikini bottom, or a pair of underwear, meets. This method targets excess skin and fat on the upper portion of the inner thigh. The medial thigh lift incision is initially made in the groin, and then goes to the back of the buttock crease. The skin will be lifted and excess skin and fat are removed; this helps to improve the leg contour and tighten the skin as needed. As with any surgery, there are potential risks and side effects. Although rare occurrences, some of these include: bleeding, infection, and scarring. 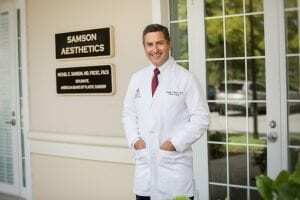 During a consultation with either Dr. Samson, you will learn which thigh lift method will provide you with the best body contouring results, your expected recovery period, and what you may anticipate during the healing process. In order to develop an idea of what to expect from a thigh lift, view Dr. Samson’s thigh lift before and after photos.